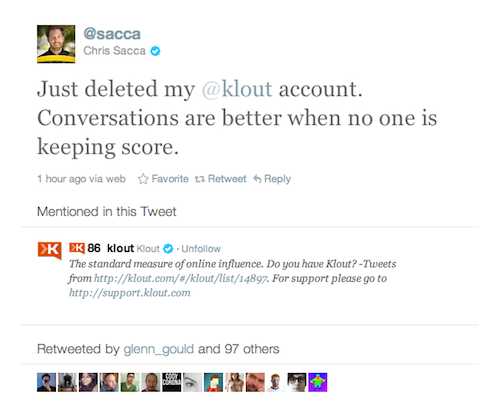 Angel investor Chris Sacca has deleted his Klout account, which indeed is no longer active although the Klout extension for Chrome still shows he has a score of 70. Chris's reason for deleting his account, as he explained in a tweet: "Conversations are better when no one is keeping score." He followed up with a zinger: "Dance like no one's watching. Sing like no one's listening. Tweet like no algorithm is coldly deciding your social worth." Klout made it easier for people to delete their accounts just last week and recently adjusted its algorithm and made the reasons for score changes more transparent; some people's scores dropped as a result. We're betting more people will ask questions like these, both in response to Chris's news: "If VC @Sacca don't need @klout should I?" tweeted Stanley H. Griggs, a startup geek in Philadelphia, and "Is 'early abandoner' the new 'early adopter'?" tweeted Hunter Hopcroft. We have asked Chris about his decision and Klout CEO Joe Fernandez for a comment. We will update if we receive a response. Chris's best-known angel investments include Twitter, Posterous, Uber, Instagram and Turntable.fm. He has also invested in Kevin Rose's latest venture, Milk, as well as Chartbeat, Bitly, Backupify and Gowalla. Exits include Heroku, Photobucket and Backtype. If you have the Klout extension for Chrome, you can still see Chris Sacca's Klout score even though he has deleted his account.